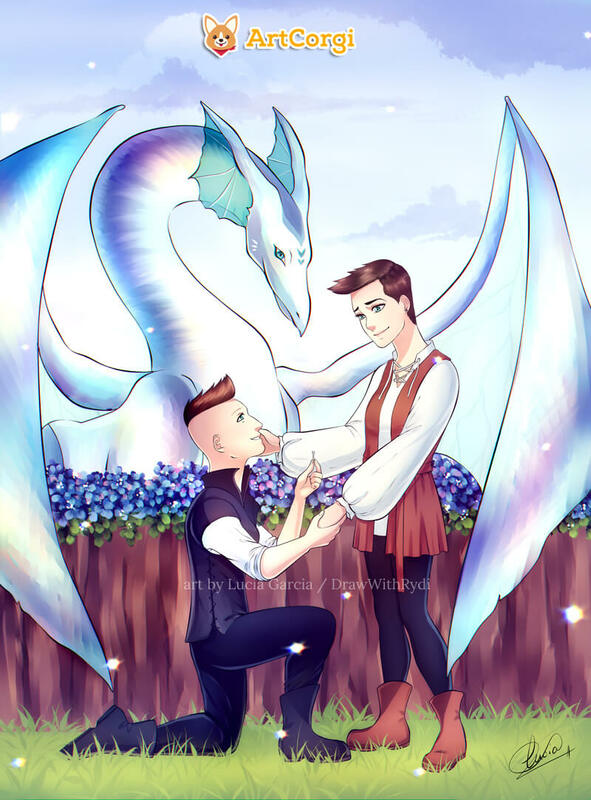 Proposal artworks are one of our favourite kind of commissons here at ArtCorgi. And not just because the marriage proposal of our founders led to ArtCorgi being born! Marriage proposals are such romantic and special events in people’s lives. Creating an artwork to celebrate and immortalize that moment forever allows you to have a tangible keepsake of that precious occasion. Additionally, as Simone gracefully explained “It’s also a test of how well you know one another”. What makes these artworks so special is that you can showcase just how much you know that person. How much they mean to you. And that’s what Amanda did in her proposal artwork! She made sure to include all the things her partner loves to make it even more special for her! Isn’t that romantic? Amanda chose to work with Lucia Garcia to bring her proposal artwork to life in her Painterly Anime Illustrations style. Read on to see why she chose this style in particular and how her proposal went! 1. Hi, Amanda! Would you like to tell us a bit about yourself? My name is AJ and I am a writer and photographer, by trade. Art has always been very important in my life; however, I have never been exceptionally skilled at drawing. 2. But, you’re very talented in other creative areas! That’s great! How did you come up with the idea to commission a piece of art to use on your proposal? I knew I wanted to do something unique for my proposal to my girlfriend. We are both massive fans of art and self-expression so it was not surprising that I decided to use art to commemorate the big event. 3. How interesting! What made you choose ArtCorgi for your proposal art? How did you go about choosing an artist? I took to the internet after not being able to find any friends who were capable of creating the high quality art I was looking for. 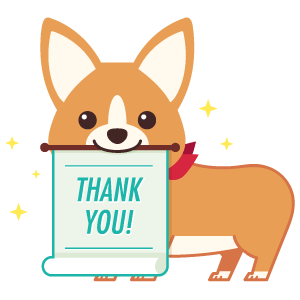 I happened upon an article that described how ArtCorgi was founded and it seemed like a match made in heaven. After browsing the site, I was absolutely sure that this was the organization I wanted to help me. I went into this endeavor looking for an artist who has a style that is reminiscent of anime/manga because my girlfriend and I both enjoy watching anime together. I also thought it would be a fitting style for the dragon I wanted to incorporate into the piece. When I found Lucia’s artwork, I knew that there was no other artist who could complete our piece better! 4. I’m so happy to see you decided to add a dragon to your piece! That’s very unique! What made you choose a more fantasy/medieval theme for your proposal artwork? My fiancé absolutely loves dragons. She has since she was a young child. It was crucial to me that I included a dragon in the work of art because it symbolizes the love and protection of a mythical creature so dear to her. I decided to dress us in medieval clothing to tie together the dragon with us in the foreground. It did not make sense to have modern dress with a dragon. Plus, I think it speaks volumes about our personality and interest in all things metaphysical. 5. It certainly does! How did you incorporate the artwork into the proposal? Additionally, how did your (now) fiancée react? I had the final piece of art, beautifully crafted by Lucia, printed out by a trusted canvas printing company. It was then mounted into a beautiful white frame. I presented it to her, dressed in similar clothing as my depiction in the artwork, and asked her to marry me. My fiancé was surprised and absolutely floored! She adored the detail in the art, the symbolism and began crying. She couldn’t stop telling me how beautiful it was! We plan to travel the country within the next year and, even though we are downsizing dramatically, this piece of art will be one of the few things we will be keeping. 6. Is there anything else you want to share with us? Thank you again for the wonderful work of art! I’m so pleased by how beautiful it is and how much my fiancé loves it. This piece of art will be cherished forever. Thank you for letting us get to know more about you and your unique proposal artwork, Amanda! We wish you both the best in your new life together! Want an amazing custom artwork done for you but you don’t have the time to browse hundreds of artists? Check out our Premium and Royal plans and we’ll curate artists selections specifically for you! 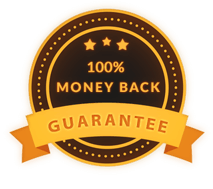 You’ll get the perfect artwork with zero hassle! 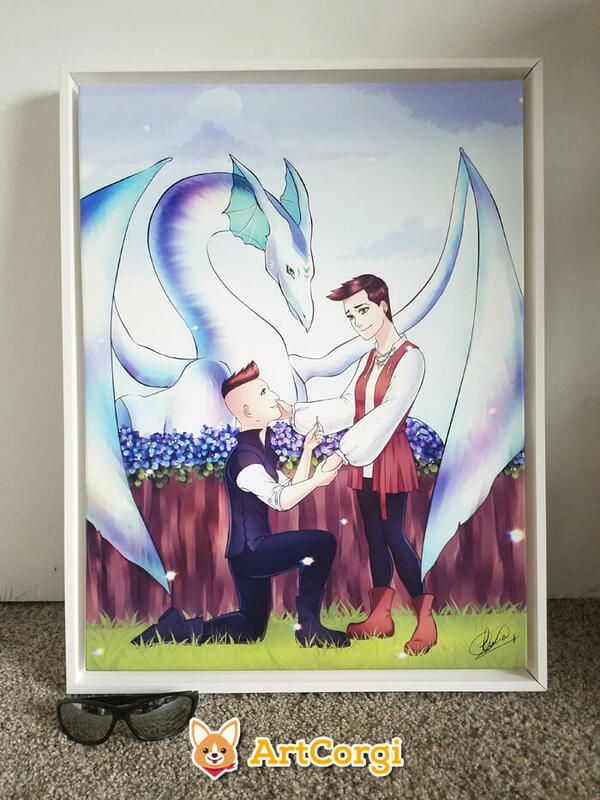 This entry was posted in ArtCorgi, Client Spotlights, Commissions and tagged amanda, anime art, dragon, Lucía García, marriage proposal, proposal, proposal artwork.